This picture really did capture exactly how I was feeling that day. Plain old tired. It had been a long week and that morning we took Ava to the zoo which was very fun but very active and come 12:30/1 p.m., a.k.a nap time, I typically hit a wall but I love this outfit so much that I had to capture it before I put it off any longer. 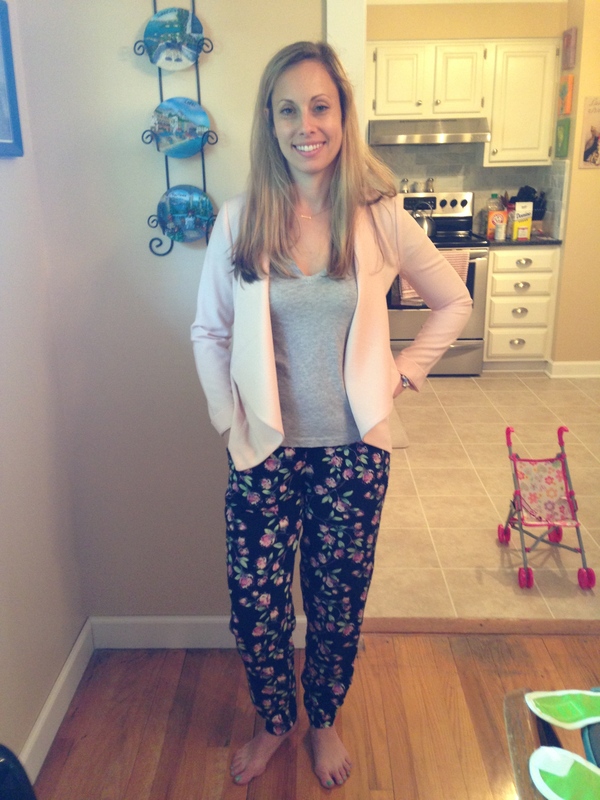 The pants I found at Kohls, specifically Lauren Conrads line, and they are super comfortable and versatile so I could easily wear them to work, church or even out on the town. Since we have a no shoes in the house rule, I didn’t sport the fun strappy flats I wore with them the other night but the sky’s the limit with shoe pairings for these pants. There’s not much to say about the t-shirt other than I believe a gray t-shirt (ideally, more than one) should be a staple in every girls wardrobe. I found the jacket at Forever 21 and as someone who’s low on time in the morning when running off to work, loves this jacket because it never wrinkles and is lightweight. It’s perfect heading into the summer months, especially if you have a frigid office and need a little something to throw over that blouse or button-down. Here’s the un-cropped, true glamour shot that includes Ava’s baby stroller, her neon green bib in the lower right hand corner and a handful of ingredients on the kitchen counter that I had put out to make zucchini muffins. It’s no secret, I love my accessories but the ones I have found tricky to wear, both day and night, chasing after a toddler are bracelets. This combo I tried over the weekend seems to be the best fit for adding a little something to my plain old t-shirt or tank during the day and then transitioning to a nicer outfit for dinner out with the girls. The turquoise ones I got from Kohl’s over the weekend and came as a set from Lauren Conrad’s line. They’re nice and stretchy and the little gold circles don’t snag on things, at least not so far. 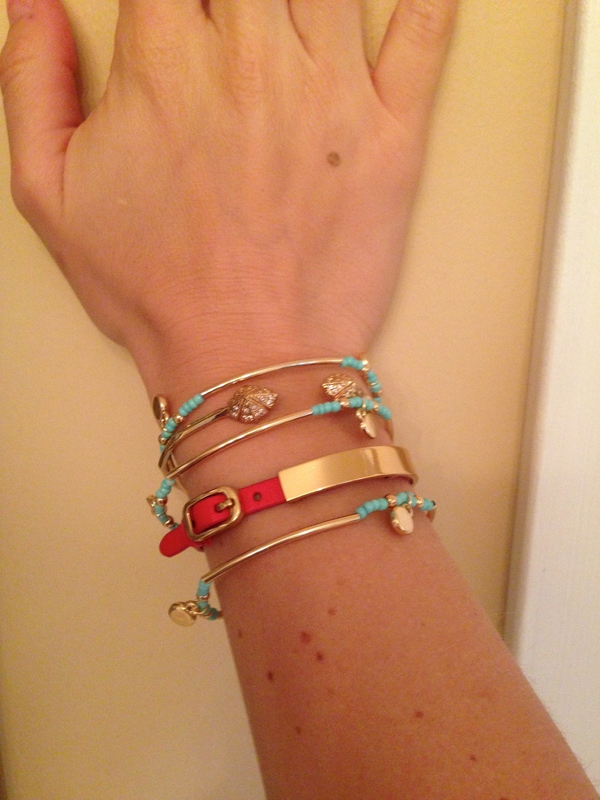 The second and fourth bracelet are both from Stella & Dot. The poppy orange one with the little buckle is called their Enlighten Bracelet. All net proceeds benefit Every Mother Counts, a non-profit organization dedicated to making pregnancy and childbirth safe for every mother. Whenever I find a cute piece of jewelry that goes towards a great cause, it’s a no brainer in my mind. Who doesn’t like giving back, while looking stylish.